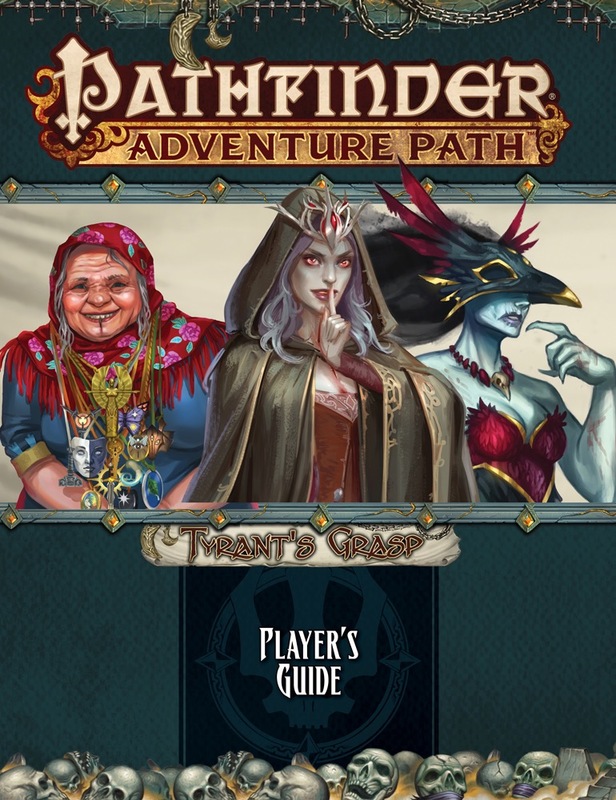 The Tyrant's Grasp Player's Guide gives players all the spoiler-free background, information, and inspiration they'll need to create characters ready to hit the ground running in the Tyrant's Grasp Adventure Path! 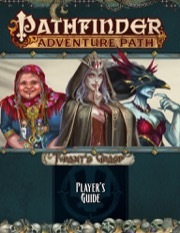 Within, players of this campaign will find everything they need to create backgrounds tied to the Pathfinder Adventure Path's themes, along with new campaign-specific traits to give brave heroes the edge they'll need to take on the dangerous threats faced in the Tyrant's Grasp Adventure Path. This player's guide also includes a glimpse of the nation of Lastwall and the frontier town of Roslar’s Coffer, as well as presenting the best class options and advice for characters ready to take up arms against the Whispering Tyrant and his vile minions. My last Adventure Path. Both awesome and sad. Wow, I love these campaign traits. They're pretty bad, except for Pessimist. Thanks for making this available, despite the office being closed for inclement weather! Can't wait for my order to ship so I can read the first volume; the hints dropped in the Player's Guide intrigue me. The campaign is supposed to be survival horror - meaning exceptionally strong campaign traits would be counterproductive. When it comes to design (creativity, plausibility etc. ), I find them solid to really good. My favourite is the Outsider - a well-grounded penalty AND bonus to Aid Another at the same time is a great idea. This really tickles my funny bone. Does the old lady remind anyone else of Benny from the Mummy? Actually reading the Player's Guide now (which, as I posted in the other thread, actually came out pretty fast). The Artisan: Okay, this one isn't the greatest. +1 on 2 skills and one of them becomes a class skill isn't bad, but Appraise isn't a great skill to use this on. Heal is better, but unless you're going for a non-magic healer build, you're probably going to (a) have this already in class, and (b) have spells that can do this job better. Rated Orange, or bumped up to barely Green if you are doing a non-magic healer build. The Lawbringer: +2 on Saves against Fear sounds quite good in an Undead/Necromancer-heavy campaign, especially if your class has a bad Will Save or is hit especially hard by being Shaken (any Occult caster). If you have Aura of Courage (in which case you are extremely likely to have a good Will Save), you might be normally immune to fear even without this, but in exchange, it improves your Aura of Courage, so it's still good, and arguably even better. Rated Blue. The Optimist: +1 on Saves against Mind-Affecting affects is less than +1 on Will Saves more generally, which can be had from some traits found elsewhere, so at first glance this doesn't seem so great. BUT, as your Charisma goes up, it gets better -- potentially a LOT BETTER. Rated Orange if your personality coach is Budd Tugly. Rated Green if you are reasonably sociable, including most Charisma-based 4/9 casters (if you are a Paladin, get The Lawbringer instead) and Swashbucklers. Rated Blue if you are a Bard or Charisma-based 9/9 caster. The Outsider: As noted above, +1 on 2 skills and one of them becomes a class skill isn't bad, but in this case, the skills are Stealth and Survival, making this a good bit better than The Artisan. On the downside, you have trouble accepting aid from others, but on the upside, you get better at giving it out. Rated Green overall. This would be both mechanically and thematically sound on something like a Helpful Halfling build, in which case it becomes Blue. The Pessimist: A trait other than a Campaign Trait is supposed to be worth approximately half a feat, and in keeping with this, you get +1 to your Will Save, which is half as good as the feat Iron Will. Campaign Traits are supposed to be better than normal traits, and in keeping with this, you get a once per day reroll to use on an ally's failed Save (any Save, not just a Will Save, and you get to pick the better result). Rated solidly Green. The Reclaimer: Getting a flat +1 bonus on Perception (the best skill in the game) is good. Getting a +1 bonus on both attack and damage rolls against anyone that hurt your friends is not bad. Putting these together comfortably gives this a rating of Green. The Snoop: This one is a bit of an odd duck, seeming more fit for an intrigue/political campaign. Nevertheless, getting +1 on 2 skills and getting both of them as class skills is pretty good, especially when one of them (Knowledge (History)) is declared as being of elevated importance in this campaign. On top of that, you get a once per day reroll on a Bluff or Sense Motive check against a creature you have known for at least 24 hours, and get to pick the better result -- might be useful for ferreting out those Whispering Way cultists. Rated Green. The Word: A trait other than a Campaign Trait is supposed to be worth approximately half a feat, and in keeping with this, you get +1 to your Fortitude Save, which is half as good as the feat Great Fortitude. Also as noted above, Campaign Traits are supposed to be better than normal traits, and in keeping with this, you get a once-per-day half-strength Lay On Hands if your class doesn't give you Lay On Hands, or half of the Extra Lay On Hands feat if it does. Rated Green if your class does not give you Lay On Hands, or Blue if it does. Note that unlike some other sets of Campaign Traits, nothing above merits a Red rating, and only the first one merits an Orange rating. Looks like Arazni in the middle on that cover. I'm sure that smiling lady who wears holy symbols from a variety of gods is a very nice lady who isn't a unique brand of religious crazy or a serial killer of priests. ^That would sure be a lousy job . . . especially if you keep getting ones that hate the guts of the ones you just got before. From looking at them while I was doing the above review, it seems like the second effect is instead front loaded. I see what you're asking. We've done that in a few APs before (like Strange Aeons and Return of the Runelords), but not in this one.